A continual tug of war between various agencies helped the Forest Conservation Act to evolve to its present form. Environmental issues in India are contested by different social groups, including the state. Since the law vests and divests contesting groups with rights and resources, it has itself become a subject of contest. Wildlife enthusiasts demand legislations to make sanctuaries inviolate from human interference, while others demand laws protecting the rights of forest-dwellers. It is, therefore, relevant to understand how laws change over a period of time. In this respect, it is illuminating to explore the changes in the Forest Conservation Act, 1980 (FCA). Before we do this, a few observations about the nature of law. Any law exists and acquires meaning in a social context. Various social groups and classes exert pressure on the state, leading to changes in laws, which, in turn, mediate social relations. From this perspective, FCA is an interesting case in environmental law. It's curious to note that the peculiar format of FCA arose by an accident. Despite the advice of the Central government to stop the Silent Valley project in the 1970s, the recalcitrant Kerala government was insistent on going ahead with it. The Central government had already experienced the reluctance of the Uttar Pradesh government to follow its directive and stop green-felling in the Uttarakhand region. To avert the impasse, the Union government issued the Forest (Conservation) Ordinance, 1980, which stipulated that the states could not dereserve forests or put forest land to non-forest use without the permission of the Centre. The ordinance was made into an act in the same year. If the Centre translated its power into legislation and prevailed over the states, the states cast their interests in the language of the Act. They continued to convert forests into tea, coffee and rubber plantations, based on the interpretation that raising vegetation of such kind is forest use. The Union government issued guidelines clarifying these plantations were not forests within the meaning of the Act. Similarly, it issued detailed guidelines for conversion of forest land for farming, building roads, passing transmission cables, submergence from dams, and setting up of industries. The states had also used the fact that the term forest land was not defined in any legislation. The Central government now clarified it includes all lands mentioned as forest land in government documents, including private forests. Thus, the ministry for environment and forests (MEF) became the nodal agency for guarding forests. 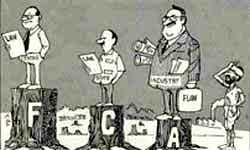 Not satisfied with the guidelines, the government amended FCA in 1987, directing the states to seek prior permission from the Central government for clear-felling forests and creating any rights on forest land through sale, transfer, lease, mortgage or any other mechanism for any person or institution. Thus, FCA freezed the ownership and management of vegetation on forest land, changeable only on the approval of the central government. In this process, it created a new relationship among forests, forest-dwellers, state and Central governments and industry. For the political parties in the states, the regularisation of encroachment could yield rich dividends without any loss of revenue. Madhya Pradesh, Kerala, Maharashtra and Karnataka regularised encroachment, but the forest departments of these states did not share the interests of the ruling political parties and created obstacles in implementing the regularisation. Despite this, regularisation of encroached cultivation has been important in the state-level political equations. After the enactment of FCA, state governments could no longer regularise cultivation on forest land. The guidelines to FCA clearly mentioned that under no circumstance should forest land be encroached upon or regularisation of encroached cultivation permitted. The encroachers were served eviction notices and even armed forces used to evict them. If FCA negated cultivation by forest-dwellers, it has also protected their subsistence base. The Central and state governments have to follow FCA while making decisions. However, decisions are not an exercise in legality, but economic, social and political in nature. Law is merely the language in which decisions are expressed. FCA shifted the locus of political articulation from the state to the Central government. The decision whether a patch of forest should be preserved or put to an alternate use, is now guided by what is regarded as a national concern. After all, the decision to build the Narmada dam and release forest land for rehabilitation and cultivation by the oustees, is a part of the political process. FCA arose as a result of a conflict between the Central and state governments on the use of forests. And in the course of its evolution, the Central government has prevailed over the states in preserving forests. But industry, the state governments and Central government departments other than MEF are not concerned about the preservation of forests. In fact, each wants a stake in their use.